Dorothy and Herb Vogel in "Herb and Dorothy 50 x 50." Directed by Megumi Sasaki. 2012. USA. 93 mins. Megumi Sasaki’s follow-up to her award-winning documentary Herb & Dorothy (2008), captures a remarkable new chapter in the life of the legendary art-collecting couple, Herb and Dorothy Vogel. Sixteen years after the Vogels transferred their collection to National Gallery of Art (NGA) in Washington, DC, the majority as a gift, the collection had grown to an unmanageable 5,000 works of art. As a solution, the national gift project The Dorothy and Herbert Vogel Collection: Fifty Works for Fifty States was conceived. 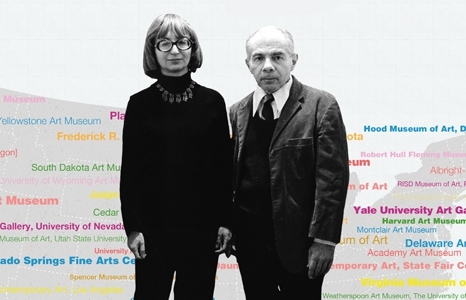 Though their collection is worth millions of dollars, the couple decided to give 50 works of art to one museum in every state. The Honolulu Museum of Art has a starring role in this documentary about the overwhelmingly positive legacy that the Vogels have left on the American art world for generations to come.